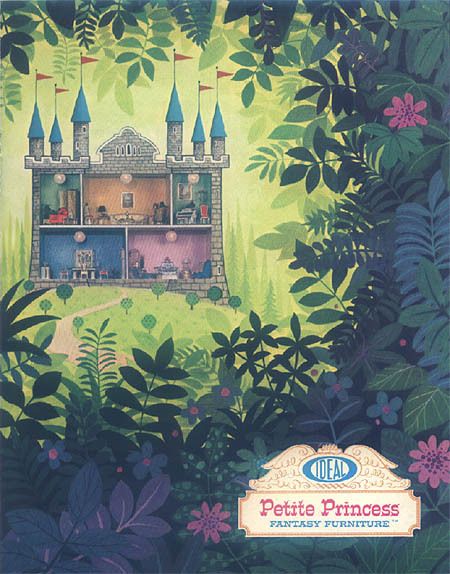 What's In The Ideal Petite Princess House? This is the unique collection of the 30 original hand-crafted 3/4" scale dollhouse furniture pieces, made by the Ideal Toy Corporation in 1964. It was dubbed the "Fantasy Collection," because of its "one-of-a-kind" hand-tailored style. The official listing below is taken from the shipping case for the "Fantasy Room," a cardboard display which was used to show off your collection along with the "Fantasy Family" of four life-like bendable rubber dolls. 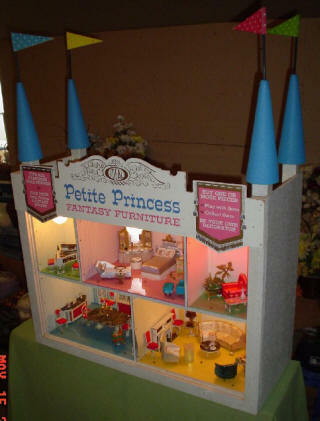 Whether you're a serious collector, or a grandmother or mom remembering a happier time from her youth, you will enjoy visiting my Petite Princess Collectibles Auctions on eBay after you've read through the official furniture listing below. Who knows? 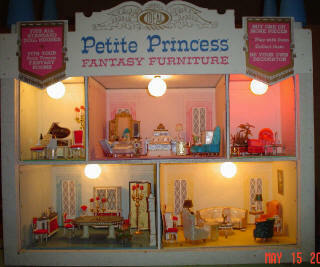 You may wish to start your own collection just like I did and make your "little princess" a very happy young lady! 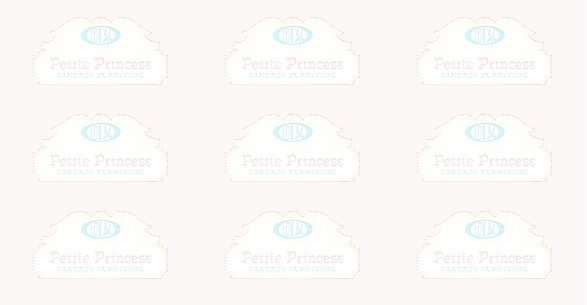 This is the Original 1964 Ideal Petite Princess Collection. In later years, the Ideal Toy Corporation produced some inferior additions to the line, as well as a less expensive "Princess Patti" line of dollhouse furniture. I am in the process of putting individual photos to the descriptions below. So please check back here soon! Genuine brass 3-branch candelabra for table or mantle use. Piano panels are decorated. Top opens to reveal handcrafted strings. Includes bench, sheet music, and metronome. Genuine brass 5-branch floor stand candelabra. Removable red plastic shades. Perfect for Music Room, Dining Room, or Living Room.